At your local bookstore and from Indie Bound, Amazon, or Barnes & Noble. A portion of the proceeds from LIBERATION supports the Terezin Music Foundation and our work to honor the artists held in Terezin with concerts, commissions, and programs in Holocaust education in the U.S. and Europe. "This anthology of poems from people all over the world gives expression to the human yearning for freedom, which will serve as an inspiration to the present and future generations." ​(View his full letter here." 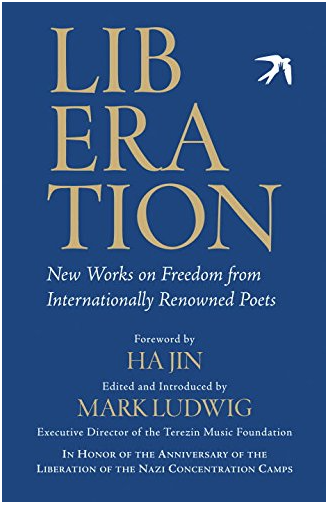 LIBERATION is an exploration of freedom by 63 of the world’s celebrated poets. In honor of the 70th anniversary this year of the liberation of the Nazi camps, TMF director Mark Ludwig invited the top contemporary voices – Rita Dove, Robert Pinsky, Yusef Komunyakaa, Richard Blanco, Fanny Howe, and many others – to write poems on the theme of freedom as it inspires them personally and creatively. The result is artistic representation of the universal yearning for freedom in 82 poems from 25 countries, and powerful stories of oppression, imprisonment, and liberation. This collection demonstrates the power of art to heal and brings attention to freedom as a basic human right. "These poems give a lot of pleasure and celebrate our existence. They remind us of the joy of being alive and able to work and do something decent. They compel us to appreciate the possibilities of life while commiserating with those who are deprived of them." LIBERARTE is a project of the Terezin Music Foundation and is created and produced by TMF Executive Director Mark Ludwig. TMF is a non-profit organization inspired by the artists imprisoned at Terezin and dedicated to honoring their creative spirit with commissions, concert events, and programs in Holocaust education.